Situated in Batavia The Garrison Inn has a garden. With a shared lounge the property also features a bar. There is a restaurant. At the bed and breakfast all rooms are equipped with a wardrobe. The rooms are equipped with a private bathroom with free toiletries. The Garrison Inn offers a sun terrace. Hiking is among the activities that guests can enjoy near the accommodation. Whitefish is 27 km from The Garrison Inn. 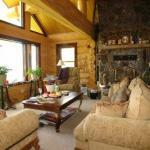 The nearest airport is Glacier Park International Airport 22 km from the property.